Fast – We will have somebody onsite within 2 hours of your initial phone call to assess the damage and begin the cleanup process. Experienced – Our company and and its employees are licensed with the IICRC, and we have been in business since 1995. 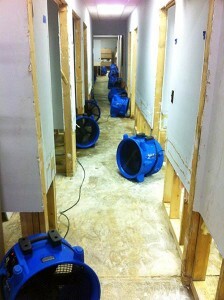 More specifically, water mitigation is one of our primary specialties. Efficient – We will mitigate the damage to your property as quickly as possible with the express intention of minimizing the impact on the property and any occupants present. Equipped – Spectrum is equipped with an arsenal of the most current technologies. Safe – Our experts are trained to first address any safety hazards present in the work environment. We do this because we care about our clients and our team. Caring – We understand that these situations can be very hard on owners and occupants. Our staff is comprised of people that genuinely care about the wellbeing of our clients. Contamination – If the source is from a sewer or floor drain, DO NOT touch any affected items or materials – Wait for professionals to arrive. Electricity – Shut off the power in the affected areas. If you have to wade through potentially electrified water to get to the electrical panel, it would be better to wait for professionals to arrive. Wet ceilings – If a drywall ceiling is sagging, steer clear. It could potentially fall at any moment. Slip & Fall Hazards – Transitioning from a wet area to tile or hardwood can be dangerous. Be careful! Our customers have a lot to say about our amazing team!